Last week we handed over the Gallery and Museum to the builders. The buildings that we have wandered around so freely are now only accessed by special permission and under a strict code of dress. It’s a strange parallel with what I have been researching this week; the Victorian etiquette of visiting, where, although Victorian women weren’t required to wear hard hats and high visibility jackets when entering houses, their dress had to adhere to the strict rules of polite society. 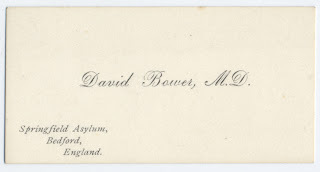 Before you were allowed through the doors of a Victorian host’s house it was more than likely that you would have had to have taken part in the ritual of the visiting card (something which I may get funny looks for if I try it out on the builders). My main source of reference has been Cassell’s Household Guide to Every Department of Practical Life which has amongst other gems cures for Chronic Gout, the care of German Canaries and a rather disturbing section on cooking otters. It also has four pages on visiting etiquette to guide people through the mine field of turned down corners of cards, visiting during illness, respectable time left to return a call etc etc. 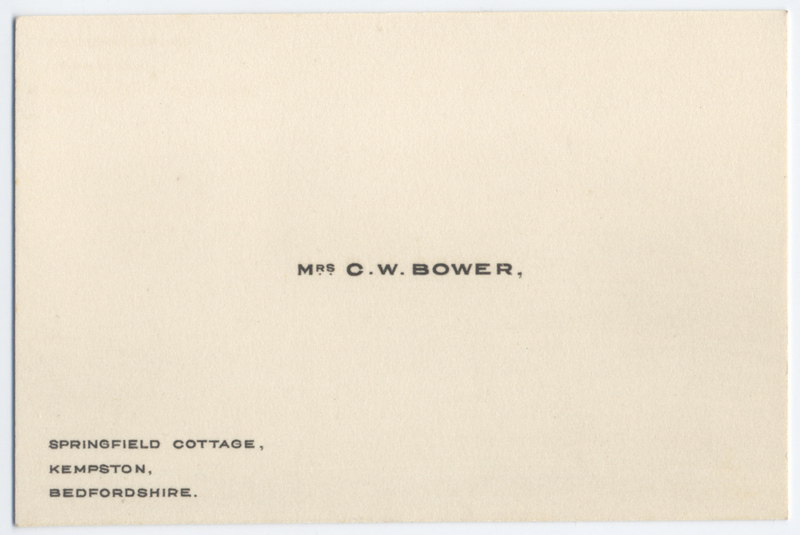 ‘Cards turned down at the corner signify either that they have been sent by a servant, or that the visitor had no intention of paying a personal visit beyond the threshold of the residence’. Mrs Beeton in her Book of Household Management also has lots to say on the subject including helpful hints such as ‘A strict account should be kept of ceremonial visits, and notice how soon your visits have been returned. An opinion thus be formed as to whether your frequent visits are, or are not, desirable’. 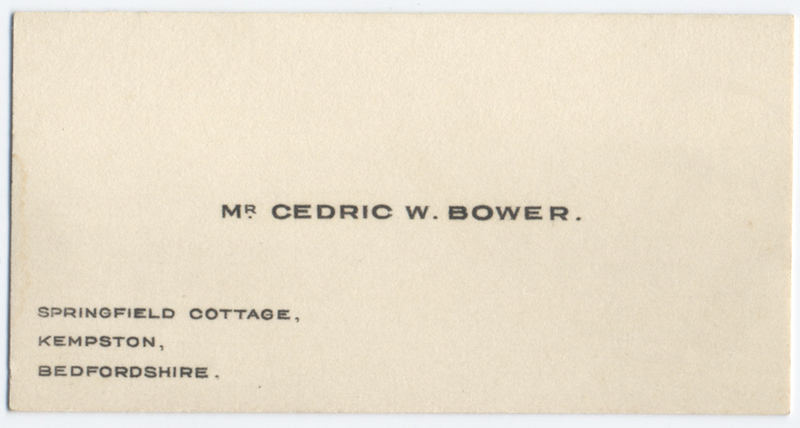 Unfortunately we don’t have any of the Higgins family visiting cards, we know that Cecil had them as we have a receipt from a stationer in Baker Street for 40 of them, but none of them were kept which is a real shame. 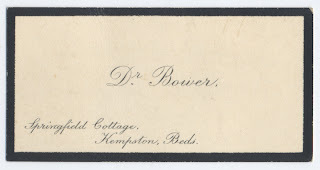 What I have found, is a selection of cards belonging to the Bower family who ran the Springfield Asylum in Kempston, a private asylum referred to in a note with the cards as a ‘mental home for the aristocracy’. What is nice about the cards is that they are good examples of the different types of card a family would need. 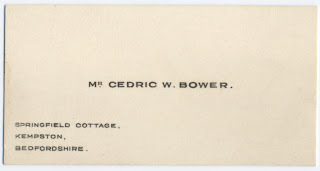 There are cards for home and work depending on the nature of the visit they were left at and cards for times of mourning when the card is framed with a black border. 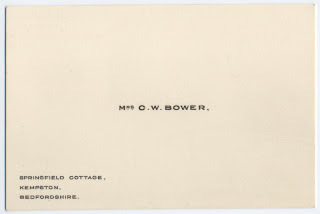 They also show the difference between men and women’s cards: Mrs Cedric Bower’s card is larger than her husbands as men used smaller card cases to fit into their waistcoat pockets and off course whilst Mr Cedric Bower’s card is in his own name Mrs Bower’s is addressed as the wife her husband. 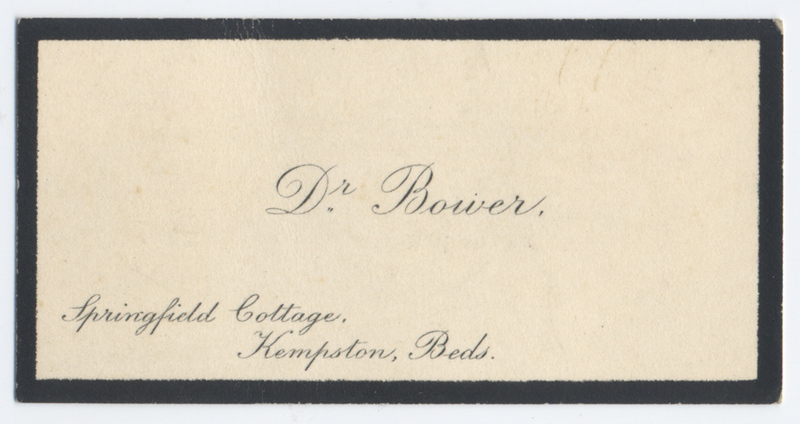 Mrs Bower's visiting card which is larger in size than her husbands. Visiting cards allowed very little room for individual taste and were described at the time as resembling one another, 'much as one dress suit resembles the next'. At least Victorians could carry them in a variety of beautiful cases, such as this one from the 1840’s.